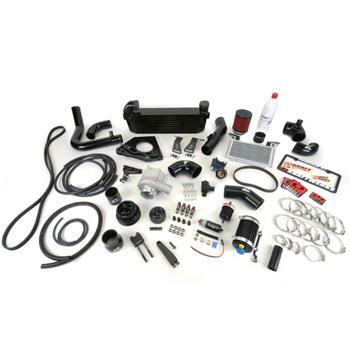 KraftWerks is proud to introduce its completely redesigned Mazda Miata supercharger systems. Like all KraftWerks supercharger kits, Miata systems are based off of the impressive Rotrex supercharger and include everything necessary for a truly bolt-on installation. At the heart of each KraftWerks Miata kit is the Rotrex centrifugal supercharger. Rotrex’s patented traction drive technology works unlike any other supercharger, and means that power’s always available, all the way to redline. Each Miata supercharger system is a comprehensive design and includes all necessary components to ensure safe, reliable operation. Standard-issue with each kit is a large, front-mount intercooler to help ensure low intake air temperatures for optimal performance. All necessary aluminum tubing, silicone couplers, and clamps are also included for easy installation. Proper air/fuel ratios are ensured with the included Grams Performance 350cc/min. fuel injectors, Grams 255 lph fuel pump, and electronic fuel box. Convenient, plug-and-play fuel injector adapters are also included, making each kit a true bolt-on experience. Rotrex superchargers are renowned for their compact size, high adiabatic efficiency, low vibration, and quiet operation. Their unique traction drive technology is what makes all of this possible, which, unlike other superchargers, transmits power through frictional forces between its rolling elements. Each Rotrex unit features its own self-contained oiling system that remains independent of the engine. Its dual-action oil pump supplies traction fluid to the supercharger while the supplied cooler ensures proper fluid temperatures at all times. The KraftWerks Miata supercharger system provides instant throttle response and a progressive power curve that increases all the way to redline without the typical spiking or surging turbochargers are known for. This unique, more useable power curve results in reduced cylinder pressures, less strain on engine components, and increased reliability. Rotrex superchargers also operate much cooler when compared to turbochargers and other supercharger systems, which reduces the engine’s intake air temperature as well as its risk of detonation. Improved support on custom nose pulley for water pump. Pulley options offer customers the ability to increase overall power delivery to more heavily modified engines. 2.5” mandrel bent aluminum hot side tubing into intercooler.